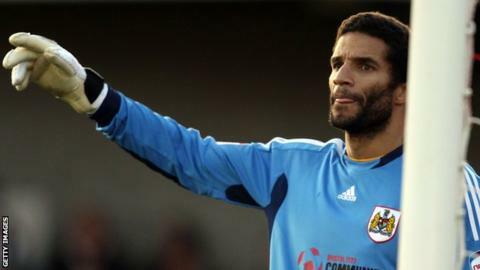 Former England keeper David James is to coach at Conference Premier side Luton Town, the club he supported as a boy. The 43-year-old is pursuing his Uefa A coaching licence and will assist boss John Still, but says he will not play. "My commitments to TV wouldn't allow me to play anyway," the ex-Liverpool keeper told Luton's website. "I'm retired. Playing is not something I'm looking at doing. I want to qualify as a coach and eventually do management and my Pro Licence." James last played in England for Bournemouth, but left the south-coast club in March to join Icelandic side IBV, where his former Portsmouth team-mate Herman Hreidarsson was manager. After a season of coaching and playing for the Vestmannaeyjar-based team - Iceland's seasons run through the summer - the 53-times England cap opted to finish his qualification in the UK and gain experience with Still's side. "I feel I've been in the game so long that I need those qualifications just in case something comes up," he said. "I want it to be right for Luton. I don't want to upset what John's got in place. "I'll do anything that fulfils the criteria of the A Licence, whether that's taking the younger lads or something. If John wants me to do more, I'll come in and do it." The experience will give James his first taste of working for the club he supported as a child. He was born in Bedfordshire's neighbouring county Hertfordshire and started his career at the Hatters' local rivals Watford. "I'm a Luton Town fan, much to the annoyance of a lot of my Watford followers," said James, who played 926 games for eight different English sides. "I used to come here from when I was 10. It's an opportunity to have some involvement which would be productive to my progression as a coach, but also help push the team get the promotion it deserves."